This is an 1830 edition of theTreatise on Successful Childbirth, one of the most famous childbirth texts in Chinese history. The original text was first published in 1715 and then was continually reprinted until the mid-twentieth century. Libraries in China today own approximately 200 different editions, which were published by different people in different parts of China from the eighteenth to the mid-twentieth century. During the early nineteenth century, it was also translated into English, Manchu, Russian, German, and Polish. This particular copy is from the Special Collections Library of the University of Michigan, Ann Arbor. The author of Treatise on Successful Childbirth does not reveal his true identity and only signs himself with a sobriquet, “Lay Buddhist Jizhai,” meaning that he was a devout Buddhist but not a monk. From evidence in the text, we know that “Jizhai” was a scholar working in the government offices in Nanchang Prefecture (Jiangxi Province, in southeastern China). He was most likely serving as a legal or financial adviser to the prefect (the official in charge of governing the prefecture). Jizhai was someone who was interested in medicine and offered medical advice to friends and colleagues. Yet, he made it clear that he was a scholar and not someone who made his living as a doctor. Jizhai told his readers that childbirth was a naturally easy process that became difficult only when people made mistakes. The main problem, he said, was that women and midwives tried to push the baby out too soon, before the appropriate time for birth had actually arrived. Jizhai shared the common belief that the baby turned its body to the head-down position for birth during labor. If the mother were to push too early, the child would remain lodged in the wrong position. Therefore, the best way to manage childbirth was to do nothing and to simply allow childbirth to follow its own natural rhythm. Jizhai’s motto was, “Sleep, endure the pain, delay approaching the birthing tub.” Throughout the book, he explained that the woman should rest quietly when labor started, endure the labor pains without panicking, and not force pressure down on the baby. If his advice were heeded, everything would be fine. The baby would find its way out of the mother on its own, without any difficulty, and no one would need to perform any ritual, follow any manual, or intervene with pharmaceuticals. Even if some mistake were to be made, the best solution would be to have the mother regain her strength by resting and taking medicine to replenish her vital energies. Then the natural dynamic of childbirth would be restored, and all would be good. 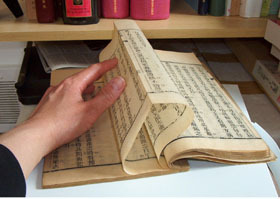 This is a printed text, which is produced by the woodblock method. Although moveable type was invented and used in China, the most common way of printing books in the eighteenth century was to use blocks of wood that contained the text for an entire page. To make a woodblock, you would first use a brush and ink to write Chinese “characters” (i.e., words) onto a thin piece of paper. You would then glue the paper face down onto a block of wood, so that the characters appeared in reverse through the backside of the paper. The next step would be to carve the wood around the characters, leaving them raised. The woodblock then would be linked and used to print the book. The number of blocks you needed varied according to the length of the book. This copy of the Treatise on Successful Childbirth was produced according to a common technique of printing two successive pages on a single sheet of paper. Each sheet then would be folded down the middle, and the book would be bound along the loose edges of each sheet, with the fold on the outer edge. Books could be of high or low quality, depending mostly on the quality of the carving and the quality of the paper and binding materials. This particular edition is of relative low quality.